Apple recently added iPhones to the list of refurbished devices it sells through its online store. The company has a small selection of iPhone 6s and iPhone 6s Plus models in varying colors and storage capacities. The average discount is about 15% when compared to new models. For example, a refurbished 64 GB iPhone 6s Plus sells for $589. According to Apple, refurbished iPhones have a new battery, a new outer shell, and are backed by a one year warranty. They are sold unlocked and without a SIM card. Apple has released a brand new version of its Apple TV Remote application for the iPhone, making it more powerful in the process. To start, the app introduces the same swiping navigation gestures found on the Siri remote and allows for use of the keyboard to input text and passwords. People who own the fourth-generation Apple TV can ask Siri on their iPhone to find and play movies or television shows, as well as control the media being played. The app also lets users play games using the iPhone's gyroscope and accelerometer. Last, the revised remote app can be used to turn on Game Mode for simpler gaming. The Apple TV Remote app is free to download from the iTunes App Store. Google has added the ability to plan multi-stop trips to its app for iPhones and iPads. The latest version of Google Maps for iOS allows people to add multiple destinations to a single excursion. Users can reorder the stops whenever needed, as well as search for specific locations, such as gas stations or restaurants, to add to the route. 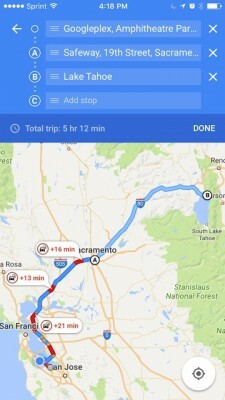 Google says once users plot their multi-stop route, navigation functions as it always has. Google Maps is free to download from the iTunes App Store. Google Maps for Android already supports multiple stops. AT&T today made it possible for iPhone owners to use their fingerprint to sign into the myATT app. The personal account tool now supports Touch ID for quick, secure logins. 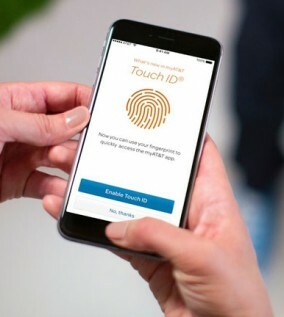 Touch ID is available to the iPhone 5s, 6, 6 Plus, 6s, 6s Plus, and SE. AT&T's myATT app is free to download from the iTunes App Store. 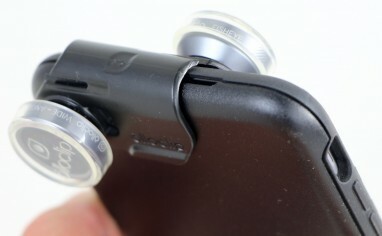 Olloclip's 4-in-1 lens is one of the first few accessories to work with Otterbox's new Universe modular case system. The case provides rugged protection, while the lenses let you be more creative with your Apple iPhone's camera. Here is Phonescoop's in-depth review of how these two products work together. Sprint today launched a buy one, get one free promotion for Apple's latest iPhones. The offer includes both the iPhone 6s and the iPhone 6s Plus. Customers must have an eligible upgrade and initiate at least one new line of service in order to qualify for the offer. Sprint said customers may purchase the iPhones on a monthly installment plan, lease the iPhones, or lease one and buy the other. However customers choose to pay for the iPhones, the cost of the second handset will be offset by a service credit applied each month. Sprint is also offering to cut $200 from the price of the latest iPads for customers who buy a new iPhone and iPad together on an installment plan. Sprint didn't say how long the buy one, get one offer will be available. It has offered similar programs for the Samsung Galaxy S7 and LG G5 smartphones. Apple and partners are making the first wave of CareKit apps available today. Apple announced CareKit at a media event last month. It is similar to ResearchKit and helps healthcare providers and organizations create health-focused applications for the iPhone. The first four apps include Glow Baby for maternity, Glow Nurture fertility tracker, One Drop diabetes monitor, and Start depression medication tracker. CareKit is composed of four modules that interact with one another. It can be used to help people manage wellness, track disease symptoms, log fitness metrics and/or statistics and then share that data directly with their healthcare provider. On the backend, the health data can be managed and viewed through customizable dashboards. While these four CareKit-based apps are being made available to consumers via iTunes, CareKit itself is a developer tool. Apple plans to release CareKit to developers via GitHub. Apple is now offering consumers the option to select its iPhone Upgrade Program when purchasing an iPhone via the Apple web site. Apple first rolled out the program last year with the debut of the iPhone 6s and 6s Plus. It packages together the price of an iPhone and AppleCare into a single monthly device payment. After 12 months, consumers can trade in the iPhone for a new one. Pricing for the 16 GB iPhone 6s starts at $32.41 per month, while pricing for the 16 GB 6s Plus starts at $36.58 per month. Prices for higher capacity models are a bit more. The iPhone SE is not included in the iPhone Upgrade Program, but Apple is accepting trade-ins toward the SE that can knock the monthly price to as little as $10. AT&T customers who have newer iPhones can now make WiFi calls when traveling abroad. The company enabled international WiFi calling with the iOS 9.3 update from Apple and refreshed carrier settings. AT&T says international calls made via WiFi will be charged at its standard rates. The feature also allows people to send text messages via WiFi, which are counted the same as regular text messages. WiFi calling, which must be turned on in the system settings, is available to the iPhone 6, 6 Plus, 6s, and 6s Plus. WiFi calling has been available for domestic calls since last year and can provide voice/messaging connectivity in areas with poor cellular coverage. Apple said iPhone and iPad owners will be able to download and install iOS 9.3 starting today. iOS 9.3 is a more significant point update than normal. It adds Night Shift to help reduce eye fatigue at night. It reduces blue light on the screen. The platform brings education tools to teachers and school admins, such as Managed IDs, and support for multiple sign-ins on a single device. iOS 9.3 also adds protected Notes, to secure files via Touch ID. 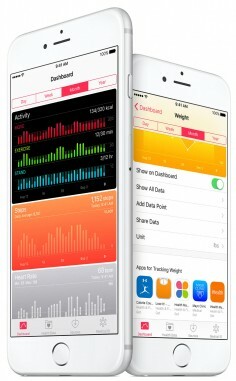 Fitness and health data is more accessible thanks to a revised dashboard in Apple Health. The platform expands News functionality by adding support for landscape video playback on the iPhone, as well as more targeted article suggestions. iOS 9.3 is free to download and install over the air, or via iTunes. 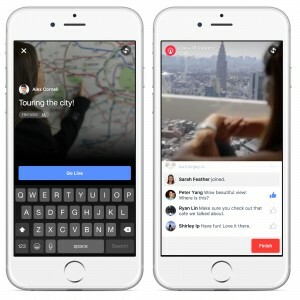 Facebook today increased the set of people able to make use of its live video feature to all iPhone owners in the U.S. Facebook first tested the service with celebrities and public figures before expanding to a small set of iPhone users back in December. Similar to Twitter's Periscope app, live video from Facebook lets people broadcast live video to their friends. Broadcasters see the number of viewers and their names, and a real-time stream of comments. Live broadcasts are automatically saved to users' timelines where they can be kept or deleted. People will be able to see live videos in their News Feed, but may also subscribe to the feeds of their favorite broadcasters. Facebook will send alerts to let people know when broadcasters go live. Facebook said it expects to expand live video to more countries shortly, but hasn't said when Android devices will have access to the feature. Yahoo today updated Flickr for iOS 9 and added support for 3D Touch. For example, users can now press the app icon on the home screen and see a handful of suggested actions, such as uploading a photo or viewing Flickr notifications. Within the Flickr app, a 3D press will pop open image, folder, or people previews, as well as allow for navigation to neighboring images/folders by sliding left or right. The app also adds support for Spotlight Search, which lets users search for albums, groups, or recently-viewed photos from the search screen. Last, the app gains support for universal links, which makes sharing photos or albums more seamless by opening in Flickr itself rather than the browser. Flickr for iOS is free to download from the iTunes App Store. The 3D Touch features are limited to the iPhone 6s and 6s Plus. Sprint today said Apple's iOS 9.1 system update enables single-number calling across Apple devices when connected to WiFi. With iOS 9.1 installed, Sprint's iPhone customers will be able to make/receive calls from their primary number on the iPhone, iPad, iPod Touch, Apple Watch, or Mac computer. Sprint says the feature requires several steps to enable. Customers must install the latest OS on each device; sign in with the same Apple ID across devices; initiate WiFi calling on the primary device; and assign secondary devices to the account. Calls made over WiFi don't count against plan minutes or mobile data allotments. The feature is free to use. Apple distributed iOS 9.1, watchOS 2.0.1, and Mac OS 10.11.1 earlier today. Apple today made the final build of iOS 9.1 available to the general public. iOS 9.1 brings aboard support for Unicode 7.0 and 8.0, which adds more than 150 new emoji. The update provides a fix for Live Photos on the iPhone 6s and 6s Plus, which will no longer record video when it senses vertical movement of the iPhone itself. iOS 9.1 also smooths out performance and resolves a number of bugs. iOS 9.1 is free to download. Apple has released new versions of Pages, Numbers, and Keynote for both its iOS and Mac platforms. The iOS apps gain 3D Touch for the iPhone 6s and 6s Plus, and split-screen multitasking on the iPad. The iPad variants earn new selection gestures and a shortcut bar for reaching select tools more easily. Apple applied a significant amount of polish to Pages, Numbers, and Keynote, with improvements to file compatibility, usability, and sharing. The desktop versions of these same apps mostly added new multi-tasking gestures (limited to devices with Force Touch trackpads). Pages, Numbers, and Keynote are free to people who've recently bought a new iPhone, iPad, or Mac computer. They can be downloaded from the iTunes App Store. Apple is facing a massive judgment in a patent complaint concerning processors found in the iPhone and iPad. A jury in Madison, Wisconsin, found Apple guilty of using a patent owned by the University of Wisconsin Alumni Research Foundation (WARF) without permission. The patent involves increasing the efficiency of chips. The technology is found in the A7, A8, and A8x processors, which power the iPhone 5s, 6 and 6 Plus, and the iPad Air 2. Apple sought to have the patent declared invalid, but the U.S. Patent and Trademark Office rejected Apple's bid. WARF originally filed the lawsuit in January 2014 and just recently filed a second lawsuit concerning the A9 and A9x chips, which are in the iPhone 6s and 6s Plus and the forthcoming iPad Pro. Apple could be on the hook for up to $862 million. The trial is now moving to the penalty phase to determine how much Apple owes. Apple maintained its innocence. Facebook today said it is looking to increase the number of ways people can consume video on its platform. The company is testing a revised version of its suggested videos function on the iPhone, which purports to ease the discovery process for related strings of videos. Facebook said this revamped version of suggested videos will now also display ads. The social network is beginning to test this feature on the web and will test it on Android devices in the months ahead. The social network is prepping a picture-in-picture feature, too, that will let people watch video in small windows while looking at other content on Facebook. 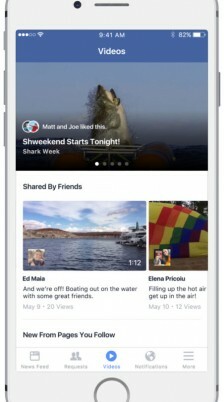 Further, Facebook is testing a button that allows users to save videos for later viewing. Last, Facebook has created a dedicated section within Facebook for hosting and viewing video. This section will have all the videos that would otherwise appear in users' Newsfeeds collected in one spot, including those saved for later viewing. 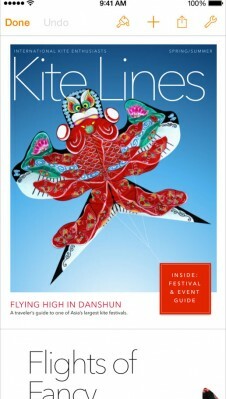 Right now, it is located under the Videos tab in the iPhone app and in the Favorites section on the web. Facebook said it hopes people will use the new features so it can continue to improve them ahead of their wider release. Apple has responded to a series of claims that suggest there are palpable differences in battery life produced by the Samsung- and TSMC-sourced A9 processor in its new iPhones. Both Samsung and TSMC are making the A9 processor for the iPhone 6s and iPhone 6s Plus. Samsung's version uses a 14nm process and has a slightly smaller footprint than the TSMC 16nm chip. Several benchmark tests (AnTuTu, Geekbench, et al) imply that Samsung's A9 drains the battery up to two hours sooner than TSMC's A9. Apple says such tests aren't realistic and real-world variances are in the order of 2-3% — or about 12 to 15 minutes per day under normal usage. "Certain manufactured lab tests which run the processors with a continuous heavy workload until the battery depletes are not representative of real-world usage, since they spend an unrealistic amount of time at the highest CPU performance state," said Apple in a statement provided to Techcrunch. "It's a misleading way to measure real-world battery life. Our testing and customer data show the actual battery life of the iPhone 6s and iPhone 6s Plus, even taking into account variable component differences, vary within just 2-3% of each other." Such variances fall into acceptable norms for most consumer electronics. Apple has added the option to purchase SIM-free, unlocked iPhones to its web site. The iPhone 6s (model A1633) and iPhone 6s Plus (model A1634) are compatible with a wide range of LTE networks, including those of AT&T, T-Mobile, and can be used on any GSM network in the U.S. or abroad. The devices are sold at full cost, without carrier contracts or obligations. Apple today said it has resolved the problem that prevented it from offering app slicing when the company first released iOS 9 last month. 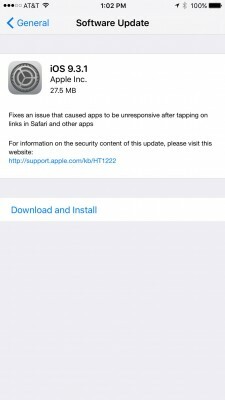 "The issue affecting app slicing has been fixed, and device-specific versions of apps will be delivered when downloaded by users running iOS 9.0.2 or later," said Apple on its developer web site. App slicing lets users download only the portion of each app that pertains to their particular device. This is important mostly to owners of 16GB iPhones/iPads, which have limited storage capacity. Apple also discontinued the Game Center development sandbox, which has been turned off in favor of the standard production environment. The Apple iPhone 6s and 6s Plus are more resistant to water damage than their predecessors, according to iFixit. The company tore down the new iPhones and discovered the frame supports a gasket that helps protect against liquid ingress. Moreover, cable connectors on the logic board — a weak link in any electronic device — are sealed with silicon. iFixit notes that Apple did not take any apparent measures to protect the speaker nor the SIM card tray, which still allow some liquid to seep in. The subtle changes made by Apple do appear to help the phone survive quick dunks in water, as evidenced by various videos posted across social media, but Apple is making no claims about the new iPhones being waterproof or even water resistant. 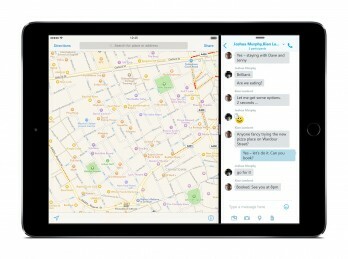 Skype has released updates to its iPhone and iPad mobile applications, adding support for iOS 9 to each. Both apps gain the ability to reply to Skype messages from the lock screen notification. Skype says Skype contacts will now show up in Spotlight queries so users can begin Skype conversations directly from Spotlight search results. On the iPad, Skype gains support for split-screen multitasking. Skype for iOS is free to download from the iTunes App Store. Apple's new iPhone Upgrade program includes a $129 surprise in the form of AppleCare+. Consumers who chose to enroll in Apple's finance plan are forced to also purchase AppleCare+, even though Apple implies the insurance program is included in the deal. Apple's web site reads, "The iPhone Upgrade Program gives you an easier way to get a new iPhone every year, and the security and protection of AppleCare+. With AppleCare+ included, you get up to two years of hardware repairs, software support, and coverage for up to two incidents of accidental damage (AppleCare+ for iPhone 6s and iPhone 6s Plus is $129 when sold separately)." These statements strongly imply that AppleCare+ is part of the iPhone Upgrade program at no additional cost. However, the fine print at the bottom of Apple's web site reads differently: "The iPhone Upgrade Program ... requires a 24-month installment loan, purchase of AppleCare+, and iPhone activation with a national carrier." Consumers who finance their iPhone 6s or 6s Plus through the iPhone Upgrade program will be charged for the phone ($649 to $949), AppleCare+ ($129), and sales tax. Moreover, the initial payment includes the entire sales tax figure, which can push the out-the-door cost to more than $100. Sprint today said it will lease the iPhone 6s to customers for a monthly payment of just $1. Consumers have to meet several conditions to get that deal. The special lease offer is available for a limited time only at Sprint-branded retail stores. The $1 price is for a 16GB iPhone 6s. Leasing a 16GB iPhone 6s Plus will cost $5 per month. 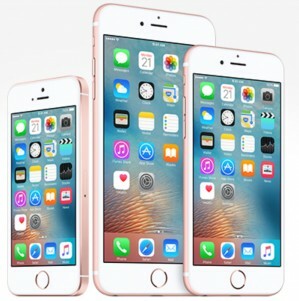 Both lease prices are contingent upon customers trading in an iPhone 6. Sprint has attractive monthly pricing for higher-capacity iPhones, as well. For example, the 64GB iPhone 6s will cost $5.77 per month and the 128GB iPhone 6s will cost $10.53 per month. Similarly, the 64GB and 128GB iPhone 6s Plus models will cost $9.77 and $14.53 per month, respectively. These prices also require an iPhone 6 trade-in. Sprint isn't leaving out customers with the iPhone 5s. Customers who trade in the 2013-era iPhone can lease the 16GB iPhone 6s or 6s Plus for $10 or $14 per month, respectively. T-Mobile said it will drop the Jump On Demand lease payment for the 16GB Apple iPhone 6s to just $5 if customers trade in an iPhone 6. 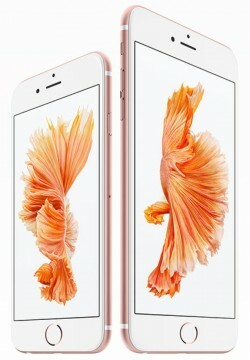 Customers who trade in an iPhone 6 Plus can lease the 16GB iPhone 6s Plus for $9 per month. 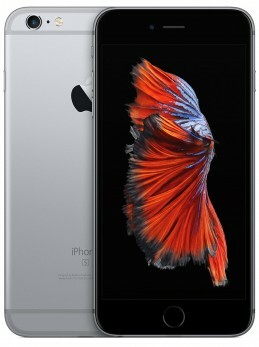 Without the trade-in, the lease payment is $20 per month for the 16GB 6s. T-Mobile says the out-the-door cost is $0, and the full price of the 16GB iPhone 6s totals $523.99 for customers who remain with T-Mobile for 18 months. By way of comparison, Sprint's iPhone lease program costs $15 per month with a trade-in or $22 without a trade-in. T-Mobile also said it will sell the Apple Watch Sport beginning Friday, Sept. 25, the same day the iPhone 6s and iPhone 6s Plus go on sale. T-Mobile is offering the wearable for $0 down and 24 monthly payments of about $14.50 for the 38mm Watch Sport ($349) and $17 for the 42mm Watch Sport ($399). 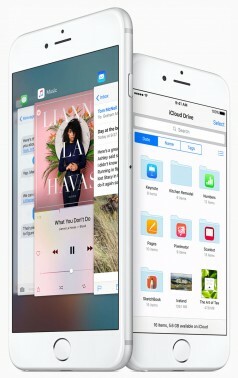 Apple today released iOS 9, a revised version of its mobile operating system. 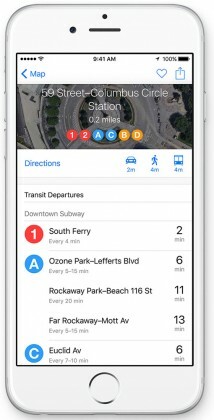 The free update gives more power to Siri, brings public transit to Maps, adds the Discover Card to Apple Pay, and installs Apple's News app. iOS 9 also makes improvements to battery life, adds wireless support to CarPlay, and provides the iPad with split-screen multitasking. The new operating system works with iPhones dating back to the iPhone 4S. iOS 9 will ship with the iPhone 6s and 6s Plus. Sprint today shared details about its iPhone 6s and 6s Plus launch plans and price points. To start, the iPhone 6s and 6s Plus will both support carrier aggregation on Sprint's 2.5GHz spectrum (Band 41). Sprint claims cell sites with two-channel 2.5GHz carrier aggregation can deliver peak speeds of 100Mbps. The new iPhones will also include WiFi Calling, a feature already available to some older iPhone models. Sprint is offering the new handsets via its iPhone Forever program. New and existing customers who turn in an old smartphone will be able to lease the 16GB iPhone 6s for $15 per month — a price that undercuts T-Mobile's lease program by $5 and Apple's lease program by $17. Existing Sprint customers who already use the iPhone Forever program (with a 16GB iPhone 6) will be able to keep their $15 monthly payment if they upgrade to the 16GB iPhone 6s by Dec. 31. Sprint is offering to pay the ETFs of customers who switch from other carriers. Last, Sprint said it will open stores at 8am on Sept. 25, the day the iPhone 6s and iPhone 6s Plus go on sale, but it will also allow customers who prefer to avoid crowds to take advantage of Direct 2 You. T-Mobile said it has doubled the number of square miles covered by its LTE network over the last year, according to a blog post written by CEO John Legere. T-Mobile is on track to blanket another 600,000 square miles of area with LTE by the end of the year. The company claims it is covering 260,000 new homes with signal every week as it continues to build out its LTE network. Legere said T-Mobile has deployed Band 12 700MHz spectrum (what the company is branding as "T-Mobile Extended Range LTE") in 170 markets, which alone covers more than half of Americans. 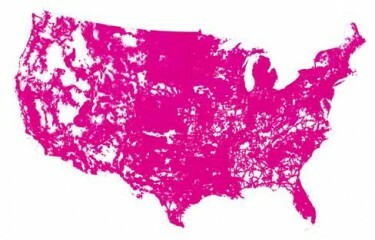 T-Mobile claims its total LTE footprint now blankets 290 million POPs. T-Mobile is so confident in the growing strength of its LTE network that it is introducing the T-Mobile Lifetime Coverage Guarantee. The new Apple iPhone 6s and 6s Plus support Band 12, which gives them greater access to T-Mobile's network than previous iPhones. As such, T-Mobile is guaranteeing that owners of the iPhone 6s and 6s Plus will be satisfied with their coverage experience on T-Mobile as long as they own the phone. Unsatisfied customers can seek a full refund during the first month of ownership. Customers who report being unsatisfied after the first 30 days with the iPhone 6s/6s Plus will be able to unlock their device at no charge and maintain the equipment installment plan at standard prices. The unlocked phone can then be used on any competing network. The T-Mobile Lifetime Coverage Guarantee requires customers to purchase an iPhone 6s or 6s Plus via its Jump On Demand program. The T-Mobile Lifetime Coverage Guarantee is replacing the Un-Carrier 5.0 Test Drive offer, which launched in June 2014. Last, T-Mobile announced its pricing plans for Apple's new iPhones. 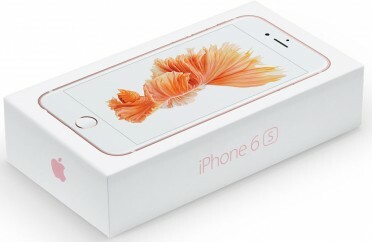 It is offering the 16GB iPhone 6s for $20 per month for 18 months through Jump On Demand. The iPhone 6s Plus will cost $24 under the same terms. The Jump On Demand program does not mandate upfront costs and allows customers to trade in their handset up to three times per year. Moreover, T-Mobile said customers who lease the iPhone 6s through Jump On Demand will be able to purchase the device outright for $164 after they make 18 payments of $20. That puts the total device cost at $524, or about $125 less than Apple charges for the handset at full retail. 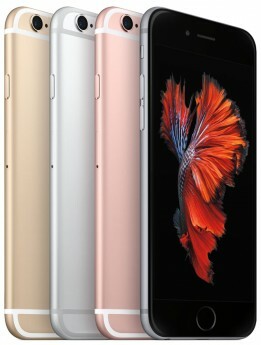 The Apple iPhone 6s and 6s Plus will be available for pre-order beginning at 12am/3am September 12. The phone reaches stores Sept. 25. Apple will let consumers lease an iPhone directly from Apple itself in a change that reflects the current dynamics in the U.S. wireless market. Consumers willing to make monthly payments will receive a new, unlocked iPhone each year. The phone can be used with the consumer's carrier of choice (AT&T, Sprint, T-Mobile, AT&T) and includes a year of AppleCare+. Monthly lease payments start at $32 per month for the 16-GB iPhone 6s and go up to $45 per month for the 128-GB iPhone 6s Plus. People who enroll in the program will need to turn in their old phone when upgrading to a new one. The move reflects similar offerings from wireless network operators, which have moved away from device subsidies in favor of installment plans.